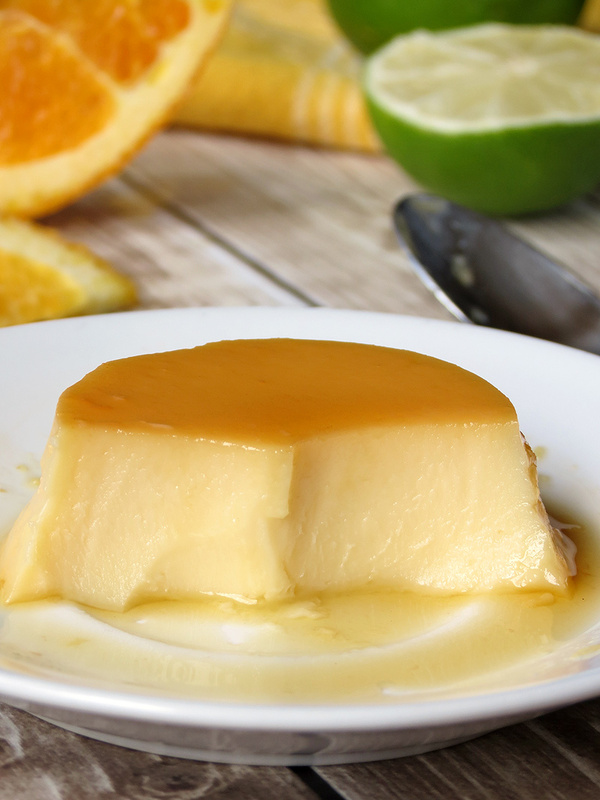 Orange Flan, or flan de naranja is a variation of the standard Spanish flan, a vanilla custard topped with caramel sauce. This variation is lighter, but has an intense orange flavor that refreshes the palate as well as satisfying a sweet tooth. It is a simple custard recipe that can be made ahead of time and makes an elegant finish to any dinner or celebration. The secret to making a smooth flan from is to bake the custard until it’s completely set around the edges but not in the middle (it should be a little wiggly), as it will gently finish cooking while it cools. If the flan is baked until the center is set, it won’t be as creamy. Put a saucepan over medium heat for 30 seconds. Add 1/2 cup sugar and 1/2 cup orange juice. With the wooden spoon, keep stirring sugar and juice mixture constantly in pan until sauce is reduced and thickened. It should be a rich medium brown color (caramelized). This will take roughly 10-12 minutes on low to medium heat. Remove from heat and quickly spoon caramelized sugar sauce into each of the 6 ramekins or large dish. (If you wait, sugar will cool and harden.) Set aside. Grate peel of half of a large orange and half of a lemon into a mixing bowl. Pour about 1/2-inch of warm water into a 9” x 13” baking dish for boiling water bath if using ramekins. If using one large open baking dish, be sure that the dish is tall enough to accommodate the water necessary to cover ¾ of the height of the dish. Add ½ cup orange juice, the half-and-half and citrus zest to a heavy-bottomed saucepan and stir. Scald 2 cups of half-and-half in the saucepan and remove from heat. Keep a close eye on the pan, so the cream does not boil over. Meanwhile in a medium mixing bowl, beat slightly 3 eggs. Mix in ¼ cup sugar. Stirring constantly, gradually add hot cream to egg yolk mixture. Stir until the sugar is dissolved. Pour the mixture slowly into another mixing bowl, straining it using the cheesecloth to line the strainer. This should catch all the citrus zest. Discard cheesecloth. Place each of the ramekins in the baking dish with water. If water level does not reach 3/4 of the way up the sides of the ramekins, carefully pour more water in. Bake uncovered in water bath at 325 degrees for 50-60 minutes, or until a knife comes out clean when inserted half way between center and the edge of dish. Note: To ensure the custard does not over-cook, check doneness after 45 minutes, then every 5 minutes or so. Carefully remove each ramekin from the water bath. Set on a cooling rack until lukewarm, then chill flan thoroughly in refrigerator – at least 1 hour. When ready to serve, un-mold by running a knife around the inside edge of baking dish. Place a small dessert plate on the top of the ramekin. With one hand under the ramekin and the other on top of the place, turn over. Tap the ramekin and the flan should drop onto the plate. If it does not, carefully “prod” the flan out of the ramekin with a small paring knife. It should slide out of the ramekin onto the plate and the sauce will surround it. Garnish with orange peel or a slice of orange, if desired.